I didn’t realize how many days have passed since I last wrote. In fact I don’t know how many, but a lot. I’m at an ashram now that’s maybe more of a collective than the previous ones? Because it’s all full of musicians. I mean, there’s a head guy, but he’s not always the one who leads. Whatever. The details don’t matter. It’s the singing that matters. We sing the names of the gods over and over. Sometimes with drums and flutes and musical accompaniment. I can lose myself entirely in singing the names of the gods, as if my entire body fills with a light so bright that it is the only thing that can be seen and all else disappears. Is that why they call it enlightenment? I realize I have felt this before. On stage. That’s an odd place to forget who I am, but it’s that the music itself takes on a life of its own. This time the scope is bigger though, the entire universe is the concert hall. The trick is that of course singing engages my ego tremendously but the same singing has the ability to overcome ego entirely and leave it behind. To lose one’s self is so rare and precious. People are afraid of it and yet they crave it. Why else would people drink until they black out? Presented with the cliff do they shrink from the edge because they fear falling or they fear being unable to resist flinging themselves into the void? I have to be careful of my talk of oblivion, I know, because that’s how one lands in forced hospitalization. But you know what, Diary? Suicide isn’t what I’m talking about here. It’s so difficult to put into words in a way that anyone who hasn’t been inside my head will understand. This is also why one doesn’t get enlightened from a book or just from hearing some guru talk. Words only get you so far. To actually understand, you have to do it, you have to live it, you have to get all the parts of your mind wrapped around it, not just the wordy parts. We’re singing. We sing every day. Everyone sings. There’s a leader but we all answer in one voice. I know no one here yet I love them all. And I feel loved. Because the love of the gods is the love that can fill the void where humans can’t. It’s like I snuck down and shook all my presents after Mom and Dad went to bed, and now I don’t get a surprise on Christmas morning. I love how you’re finally figuring it out, Ziggy. We can see how truly confused and unhappy you are when you aren’t singing–it’s a part of you that you can’t separate without wounding the whole. I am proud that you are finally coming into your own here and I just pray you can keep it up once you go back to the States. Egos are rampant here. Wow. Is it just me, or does the energy and insight of Ziggy’s story make Daron’s recent story look bland and uneventful? 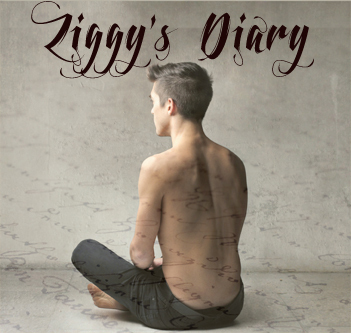 Ziggy’s diary is amazing – an “untortured” look into his very soul and Ziggy’s soul has depths not yet even plumbed. It’s what made his relationship with Daron so powerful on the page. Daron’s recent journeys into “vanilla” now look like an almost unending journey into suburban oblivion. I do hope that these two get together – they are destined for each other. Ziggy makes Daron more exciting, more fascinating, edgier, more inspired. Daron makes Ziggy more grounded and less self-absorbed. A match made in heaven if they can keep it going – not spiraling into denial as it did the last time, for some of which Daron, himself, is partly to blame. Perhaps this new-found self-awareness on Ziggy’s part can make it possible for them to live the Platonic ideal – the “other half” who completes each one. But best of all, I sure hope these two can get together and make great music once again. Daron would be the first to agree with you on “bland and uneventful.” Ziggy’s always had a lot going on underneath the veneer, but he never even let Daron see much of it. He’s going to have to let Daron in as much as Daron needs to let him in, if it’s ever going to work between them. Until that revelation, there was no real Ziggy into which he could let Daron.